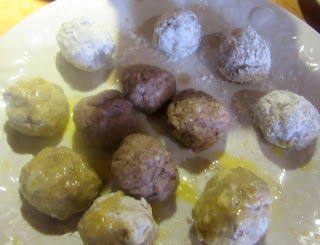 Medieval Spanish Chef: MANOS, COMER CON WITH 13TH CENTURY RECIPE FOR MEATBALLS. 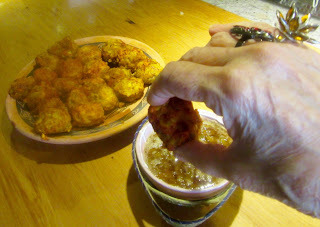 MANOS, COMER CON WITH 13TH CENTURY RECIPE FOR MEATBALLS. to eat with the fingers. Although criticized after the 17th C when the fork replaced fingers, there was an art to eating with the fingers during the Middle Ages. Solids were place in the mouth with three fingers only, the thumb, index and middle fingers. This custom was called “a la morisica” or the Moorish way, the vogue at that time. 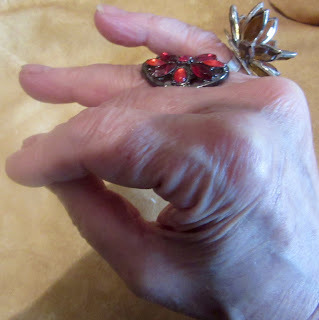 The other two fingers had to be separated for the rings were worn on the ring and baby fingers. As many as four could be worn under the lower joint and the second joint. The rings contained precious stones with magical powers that eliminated evil from various food items and diabolical powers against evildoers and spirits. Each precious stone contained a virtue against a specific type of poison in food, disagreeable incidents pertaining to the meal and infected air. This is a nourishing dish, easy to digest, fortifying and good for thin persons, the aged and weak stomachs. Remove meat from the shoulder and the leg of mutton. Remove tendons or veins. Grind it. Mix it with oil, pepper, cinnamon or lavender, a little onion juice, salt, egg and egg. (Make meat balls and) roll them in flour. The recipe does not explain how to cook the meatballs. As per recipe #4 instructions heat a frying pan and add ingredients for frying. Add meatballs and fry until done. Clean pure oil of its twigs and impurities and was it with water until it is clean; if it pleased you for each measure of oil add two measures of hot water and put it in an earthenware pot and heat until it boils; then clarify it and add honey. If you want it cooked, put one measure of oil and three of water and measure it with a stick; later add water to the pot if desired, until it reaches the measure marked, then clarify it and add honey and let it boil and after that drink it if it is God’s will and the same with the honey cooked fir drinking it in this way. If Perry’s recipe is used as a sauce, boil raisins in honey. Skim honey and serve hot with meatballs to be dipped into the sauce. This dish should be eaten using the index finger and thumb as explained above. Huici and Perry state that the author repeats here almost verbatim the recipe he gave at the start. That would be recipe #4, which is more complicated. 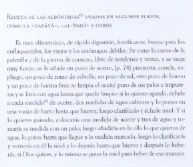 See blogs titled comino published May 27, 2013 and fuego lento September 15, 2014 for the Medieval Spanish Chef’s adaptions of recipe 4. This is not stated in the text.